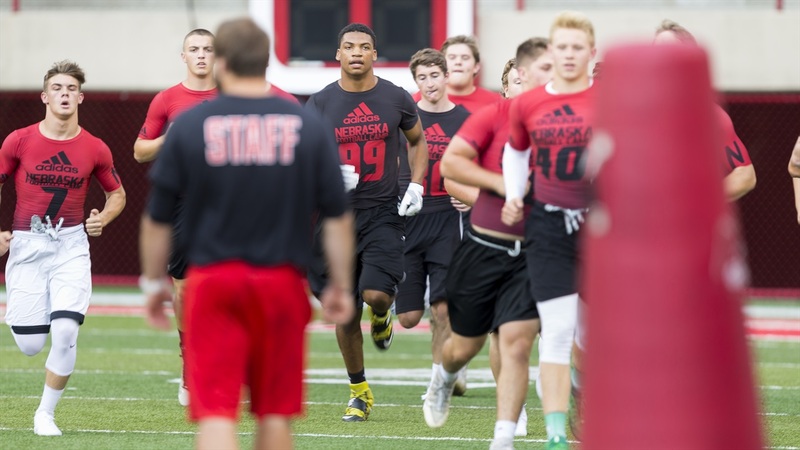 Storms tried to put a damper on the Huskers’ first Friday Night Lights camp of the summer, but an on-the-fly adjustment kept things running smoothly from the coaches' and players’ perspectives when weather forced things indoors. More than 200 prospects took part in the cap. While the majority of campers were from Nebraska, nearly a dozen other states were also represented. Here’s a quick rundown of the night. >>If you’re a Nebraska kid hoping for a Nebraska offer, these camps remain the place to be. The Huskers once again extended an in-state offer, this one to 2019 defensive end Garrett Nelson from Scottsbluff. >>While next week is expected to be bigger of the two camps, Nebraska did get some high-profile players from the 500-mile radius to Lincoln on Friday. Daniel Carson, a 2018 defensive end from Independence, Mo., made the trip up I-29, but didn’t take part in the camp. A 3-star prospect (87.4) rating, Carson has a Husker offer that’s part of a pretty impressive list that includes Georgia, Oklahoma, Ole Miss and Missouri among others. There was another impressive defensive end in attendance as well. Marcus Hicks (No. 99 in the photo above), class of 2019, traveled from Wichita, Kan., and took part in the camp. No ranking yet for Hicks, but he looks like a likely 4-star. He has offers from Kansas, Kansas State, Missouri, Oklahoma, Oklahoma State and, most recently, Iowa. Hicks has also had a busy June attending camps at Missouri, Toledo, Ohio State, Iowa and, now, Nebraska. >>Council Bluffs, Iowa, quarterback Max Duggan was also there. Duggan, class of 2019, is going to be plenty familiar with most of the FBS schools in the area. He’s already visited Iowa State, Iowa and Nebraska multiple times. >>Verbal commit Masry Mapieu took part in the camp. Judging from some of the recent interest in Mapieu from some big schools, defensive line coach John Parrella may have gotten the jump on everyone. >>One off-the-radar name to keep an eye on is 2018 wide receiver DeShawn Hanika. He’s a solid hoops prospect from Topeka, Kan., but he’s an intriguing wide receiver too at 6-3, 200 pounds. Depending on how Nebraska’s recruiting at that spot shakes out, don’t be surprised if the Nebraska staff keeps a close eye on Hanika. Check out our photo gallery from the camp here.